Technician Fifth Grade Frank D. Mauro scribbled the letter April 27, 1945, from his infantry unit in Italy to his parents in Mount Kisco, N.Y. He had met another hometown boy, described the farmhouse where he and the other GIs bunked and raved about the generosity of the locals, who gave him fresh eggs. 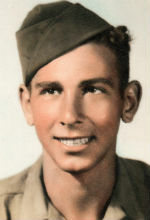 A week later, on May 4, Frank “Babe” Mauro was killed. In four days the Allies would dance in the streets, celebrating V-E Day. ALL MY LIFE, I ONLY KNEW Babe as a hand-tinted photograph on my grandmother’s bedroom dresser: an Army field cap cocked to the right on his head, light-brown hair curled on the left. When I was a boy, he looked a mature, grown man. Now he looked the 20-year-old boy he was when he died. My grandmother always said he looked like me. When Grandma died in 1988, my mother found a family treasure: a box stuffed with dozens of letters from Babe, the Army radio operator, written on stationery from camps in Georgia and New York, on onion skin and V-mail. The letters give a glimpse at an everyman’s life in the infantry, with alternating visions of excitement and boredom, beauty and devastation. For me, 50 years after Babe died, the letters were a personal project, a starting point for research into an unknown uncle who would now be 70. I studied his letters, organized them, indexed them, researched them. Almost everywhere I turned, I learned a little about my uncle, much of it contradictory, and a lot about the war. From a list of 80 veterans of Babe’s unit, more than three dozen replied to my letters. Ten more took my phone calls. No one knew him. As it turns out, Babe was among the replacements for the veterans I had found. Almost to a man, they described their capture in February 1943, the month my uncle enlisted, during a confrontation with Rommel’s troops at the Kasserine Pass in Tunisia. Mismatched, outgunned and surprised, the entire company was killed or captured on Valentine’s Day. “Rommel just outsmarted us,” said Lawrence Query, of Atlantic, Iowa. Query, 77, waited out the war in Stalag 3B, Furstenberg, Germany. Nearly every man I reached was eager to help me learn more about Babe. One of the veterans pointed me to Craig Johnson, a 27-year-old computer technician in Cocoa who was assembling a list of the 34th’s war dead. Johnson’s database included thousands of names, but not Babe’s. Still, he obviously enjoyed the military, writing: “I don’t think I’d ever like being a civilian again.” He never had the chance. There is little doubt that he drowned. His royal-blue address book (“Compliments of the American Red Cross”) is still water-stained. But my relatives remember the details differently. One thought Babe had crossed a mined bridge and tumbled into the river with a broken back. Another thought sniper fire forced his Jeep into the water. Babe died two days after the cease-fire in Italy. So why was there sniper fire? And how is a Jeep “forced” into a canal? Where did the story about a mined bridge come from? My letters seeking information from the government yielded few helpful details. The National Personnel Records Center said Babe’s file was destroyed in a fire. The “Report of Burial” notes that Babe “possibly drowned (acc. incurred when truck overturned into canal).” In other words, a traffic accident. My mother at age 3. The “Report of Death,” in clinical military style, lists various categories and questions about the death, with the appropriate boxes X-ed: Investigation Made? No. In Line of Duty? Yes. Own Misconduct? No. Was Deceased on Duty Status? Yes. Battle or Non-Battle? Non-battle. The file lists Babe’s personal effects: a plastic cigarette case, a lighter, a rosary, a penknife, a photo case, a wristwatch, 750 lire, a pen-and-pencil set. Many of the letters Babe wrote show how desperate he was for contact with home. “I’ll close now, Rosemarie, so take care of yourself. Rosemarie, Babe’s sister, turned 5 on May 22, 1945, the day the War Department telegram arrived. Rosemarie, my mother, was 3 when Babe went to war. She doesn’t remember her brother. She only knows him from information in government files, from her brothers’ memories, from his letters. And from the hand-tinted photograph on the wall in her house. Kurt Greenbaum is an information services coordinator at the Sun-Sentinel. Copyright 1995, Sun-Sentinel. Eileen, I’m so honored that you managed to find this little spot on the Internet and took the time to post a comment. I am dying to know how you stumbled on this. I will certainly reach out to you and I hope we can have some time to speak on the phone together and learn more about any common roots.